VANCOUVER, BC, April 19, 2011. Mirasol Resources Ltd. (TSX-V: MRZ, Frankfurt: M8R) is pleased to announce the results for the initial 21 drill holes of the Phase 2 diamond drilling program at its 100% owned, Virginia Project in Santa Cruz province, Argentina. Assay results received for Phase 2 holes (VG-29 to -49) have identified significant new zones of silver mineralization in the Naty and Julia Central veins, as well as additional broad zones of high-grade mineralization in the previously tested Julia North Vein. Phase 1 drilling confirmed that an important silver discovery exists at the Virginia Project (news releases of December 16, 2010 and January 13, 2011). 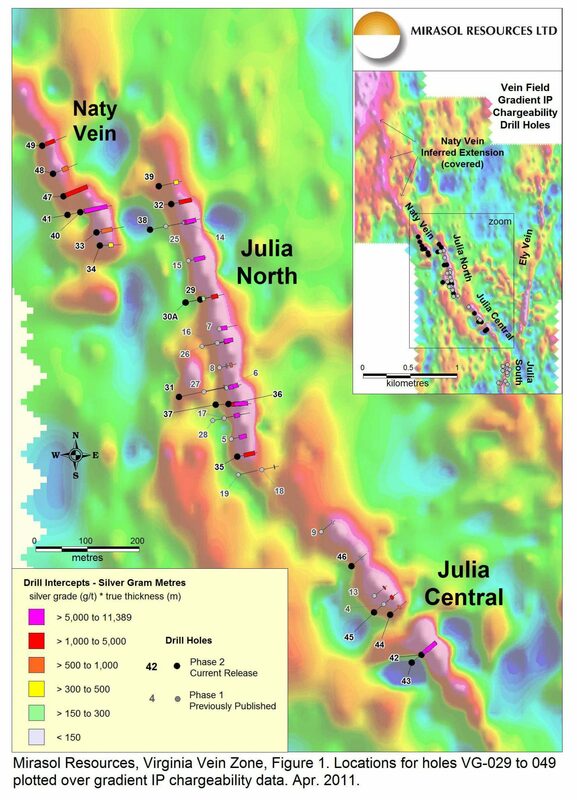 The current Phase 2 drill campaign is focused on delineation of the bonanza silver grades in Julia North and exploration of Julia Central and the Naty Vein structures (Figure 1). All 21 of the Phase 2 holes reported here (Table1, Figure 1 and Figure 2) returned intercepts of silver mineralization, calculated at greater than 30 grams per tonne (g/t) cutoff. Mineralization remains completely oxidized to depths of at least 100 metres down dip from surface in Julia North. Phase 2 drilling is ongoing at Virginia with more than 42 new, previously unreported holes, for a total of 4,000 metres completed to date. At Julia Central, holes VG-42 and VG-43 were drilled on the same drill section and both holes intersected a much wider zone of silver mineralization than was evident from surface channel sampling. Hole VG-42 intersected an estimated true width of 30.9 metres containing 178 g/t silver, including 11.6 metres of 295 g/t silver, while hole VG-43 intersected a true width of 40.8 metres containing 172 g/t silver, including 10.0 metres of 485 g/t silver (Table 1). This high-grade zone remains open to the south and at depth. Julia Central is now known to host high grade silver in quartz veins, breccia zones and faulted zones with a wide halo of lower grade mineralization, similar in character to Julia North. At Julia North, nine new holes are reported, which returned a range of encouraging silver intercepts that support the Phase 1 results. These include hole VG-36 which has the highest silver grade-thickness (gram-metre) product of any hole drilled at Virginia to date, and which contains a true width of 36.5 metres of 312 g/t silver including 5.3 metres of 1,843 g/t silver, Notably this hole has core recoveries of 90% and 85% respectively for the intercept and included high grade. Drilling to date of the Julia North structure may indicate the existence of more than one, shoot where higher silver grades and mineralized widths are present. The Naty Vein parallels the Julia North sector approximately 200 metres to the west, and is exposed at surface as mineralized subcrop and float blocks for approximately 200 metres of strike length before passing under soil cover to the north. The first shallow holes were drilled to test mineralization indicated by float blocks coincident with a strong IP chargeability anomaly (Figure 1). The best results reported from Naty to date, holes VG-40 and VG-41, were sited on the same drill section. VG-40 intersected an estimated true width of 59.5 metres containing 92 g/t silver, including 4.8 metres of 470 g/t silver, while hole VG-43 intersected a true width of 44.6 metres containing 142 g/t silver which included 8.1 metres of 510 g/t silver. The Naty Vein comprises a fault zone with quartz vein material and quartz breccias, as well as broad, lower grade zones.. Based on the initial seven holes reported here, the Naty Vein appears to be of similar character as the Julia North and Julia Central vein segments. Core recovery though the mineralized intervals continued to be variable during the early stages of the Phase 2 drill program due to the effects of oxidation and post-mineral faulting along the Julia and Naty structures. Mirasol has systematically worked through these challenges with the drilling contractor to improve recoveries in the more recently drilled holes. In addition, Mirasol brought to site at Virginia an independent, North American-based drilling consultant with extensive drilling expertise in Patagonia, in order to further improve recoveries. These combined efforts are yielding marked improvements for core recoveries in the new holes and in key holes that have been twinned to date. Assay results are not yet available for twinned holes. 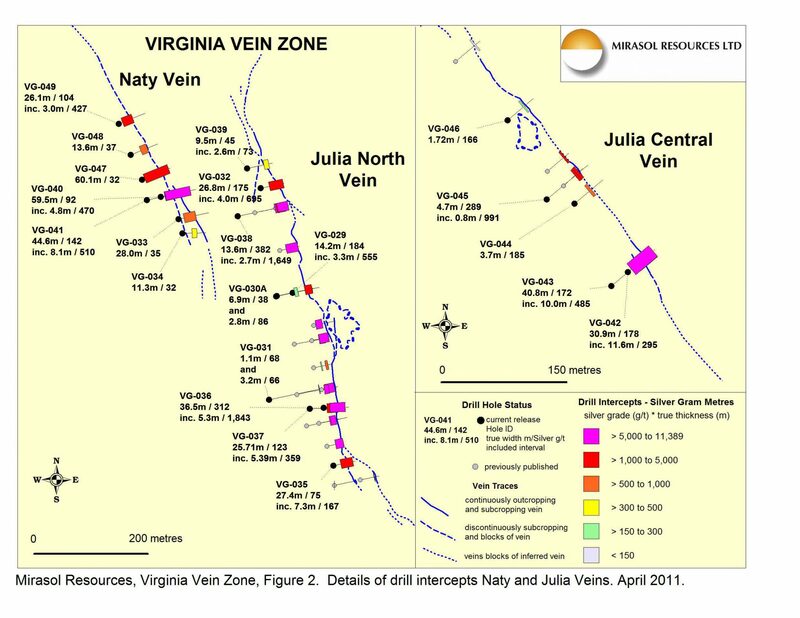 The Phase 2 drill campaign at Virginia continues to produce encouraging silver results which validate the potential of the Virginia vein system and district. Phase 2 drilling has defined new, well-mineralized zones in all segments of the vein field drilled to date. The highly-oxidized character and broad zones of silver mineralization, which commonly envelope a core of higher-grade vein and breccia material, suggest potential for Virginia to contain a significant deposit of near-surface, high-quality silver mineralization amenable to surface development.